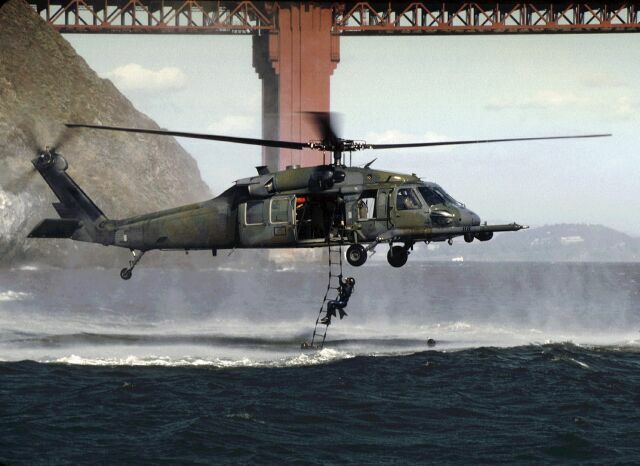 San Francisco Bay, California, USA, 24 August 2000 — California Air National Guard pararescuemen of the 129th Rescue Wing, Moffett Federal Airfield, California climb up a moving rope ladder, from the chilly waters outside the Golden Gate Bridge, up to a HH-60G Pave Hawk. Tech. Sgt. Mike Sampognaro, flight engineer, monitors the training mission from the troop door. Hovering only six feet above the waves, Lt. Col. Thomas Laut must fly with extreme care as he deals with gusting winds, sea spray, sun glare, and sea swells, as he maintains a "low-and-slow" flight. The HH-60G's primary wartime mission is combat search and rescue, infiltration, exfiltration and resupply of special operations forces in day, night or marginal weather conditions. Some members of the 129th provided technical assistance for the production of the movie "The Perfect Storm." U.S. Air Force photo by Tech. Sgt. Lance Cheung.